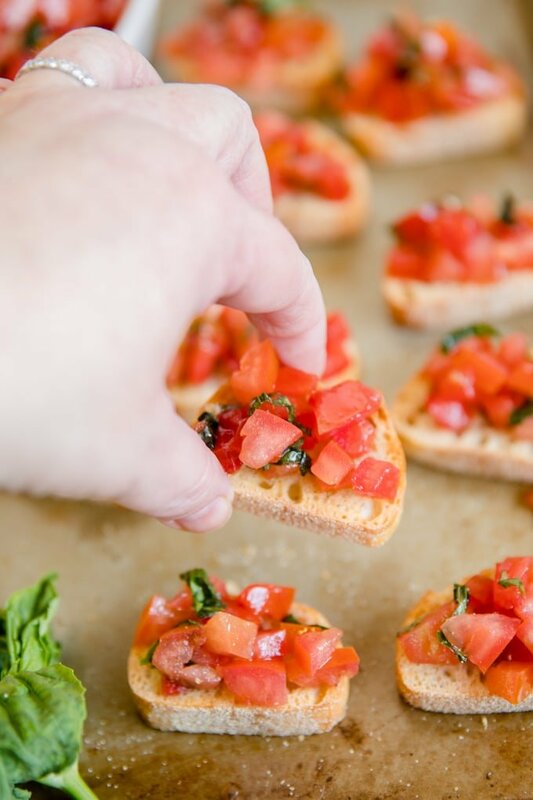 This Tomato Bruschetta Recipe is bursting with fresh tomatoes, basil and garlic, all piled on crisp, toasted bread for a classic appetizer that everyone loves! Appetizers are my party go-to, and sometimes we even enjoy them for dinner! 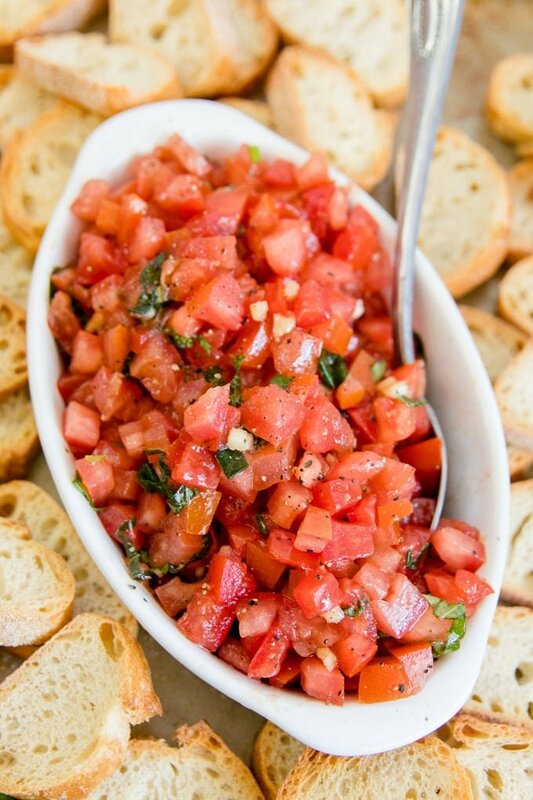 This bruschetta recipe is among our favorites, along with Fried Ravioli with Marinara and Spinach Artichoke Dip. 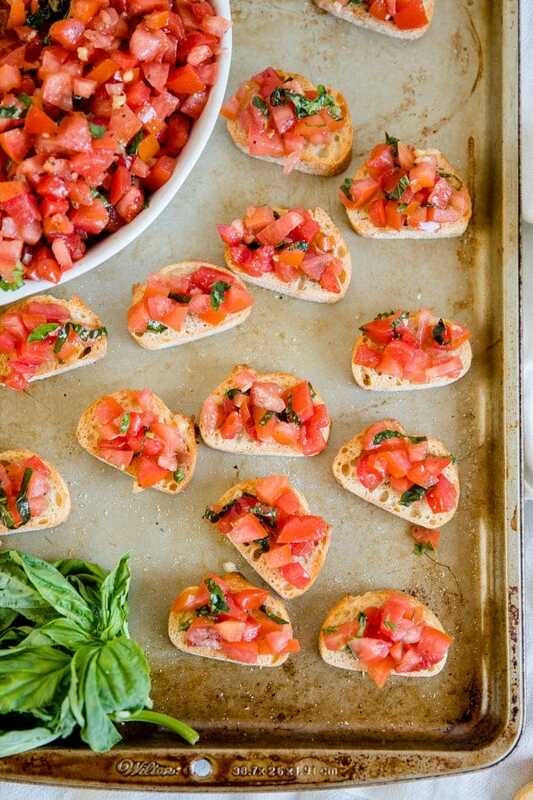 The essential basics for a good bruschetta are fresh tomatoes, fresh basil, fresh garlic and a good quality olive oil. Since there are only a few ingredients in this recipe, you want them to be excellent quality. Pair fresh tomatoes from the garden or farmer’s market with fresh basil and garlic and it’s a downright flavor explosion. Roma tomatoes are my favorite to use here because they have the least amount liquid in them, but you could use beefsteak, heirloom or even cherry tomatoes. The tomatoes are marinated in olive oil with fresh chopped garlic, basil and salt and pepper. I like to add a little balsamic vinegar to my recipe for the sweet and tangy punch of flavor. This classic appetizer originated in Italy. It is made with fresh tomatoes, basil, garlic and olive oil and served with a side of toasted bread as a snack or starter to a meal. 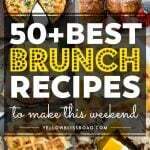 Some variations add balsamic vinegar, onions or even Parmesan or Mozzarella cheese. 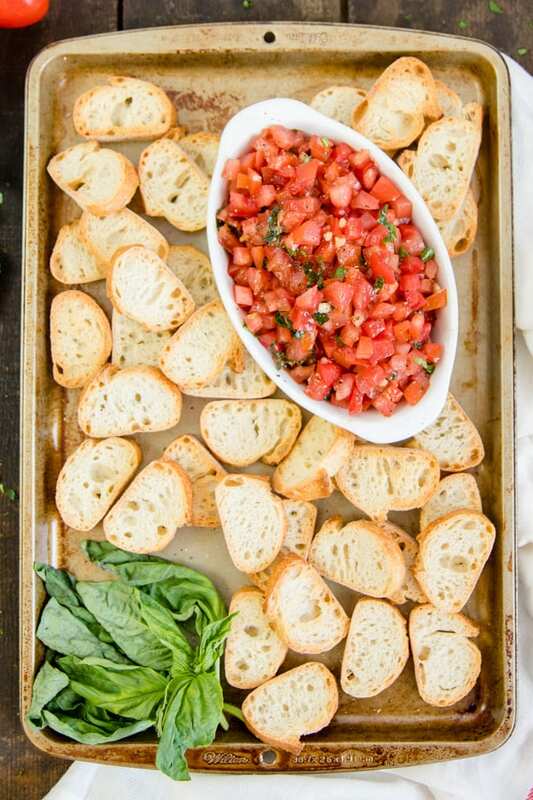 Tomatoes are marinated with basil, garlic and olive oil, then served on toasted bread. Start by chopping up all of the ingredients. Tomatoes should have the seeds removed and then diced small, garlic smashed, peeled and then minced, and basil minced or torn as well. The fresh ingredients are doused in olive oil, salt and pepper and a splash of balsamic vinegar, and then left out to marinate at room temperature. Serve with your choice of vessel, like toasted bread, crackers or pita chips. IS BRUSCHETTA SERVED WARM OR COLD? 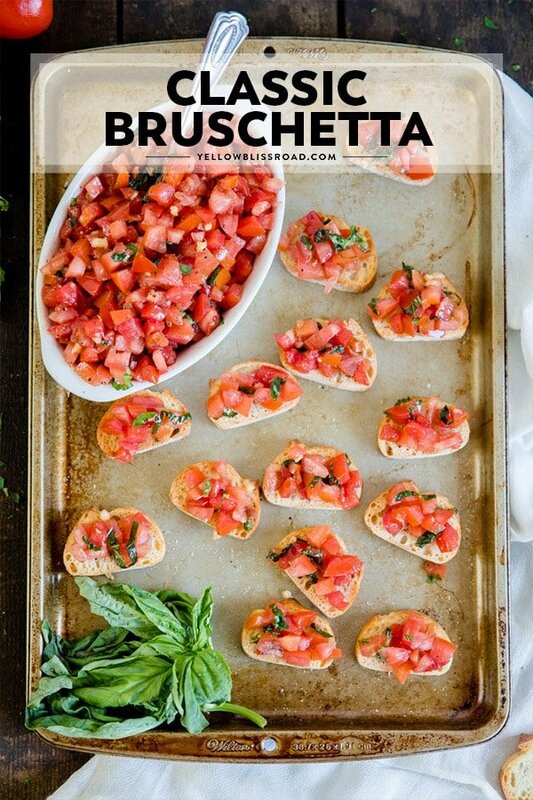 Bruschetta can be served either at room temperature or right out of the fridge. As long as you give the mixture time to marinate you’ll have a flavor explosion either way! You can store the tomato bruschetta topping in an airtight container for up to 3 days in the fridge. I recommend serving the tomato mixture in a separate bowl with crostini on the side so your guests can make their own appetizers. 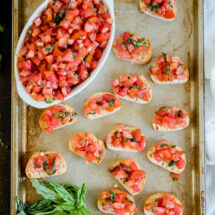 If served assembled, the bruschetta should be eaten within two hours otherwise the bread starts to get mushy. Toasted bread simply will not be good after a few hours as it begins to harden. Save leftover crostini in a sealed container and use it as croutons or to make breadcrumbs. The tomato topping is also delicious over pasta with a little added olive oil (sans bread, of course). Spread some goat cheese on the bread for a creamy bite. Add additional fresh herbs like oregano or parsley. Top the bruschetta with shaved Parmesan cheese and a balsamic glaze. Combine ingredients in a medium bowl. Season generously with salt and pepper and let sit for at least 15 minutes. Meanwhile, cut baguette into half-inch slices and toast in the oven at 350 degrees for about 3-5 minutes, or until golden and crispy around the edges. Watch closely so the bread doesn’t burn. Set aside to cool before serving. (toasting is optional, but does add to the flavor of the final product). Place a spoonful of the tomato mixture on top of each baguette slice and top with fresh basil and a drizzle of balsamic glaze (optional). Serve immediately. You can also serve this as a dip. Place the tomato mixture in a bowl with a serving spoon, and spread the crisp bread around it on a serving plate. We like to spread a little soft goat cheese or cream cheese on the bread before adding the tomato mixture for a creamy bite.